About a week ago we got out tequila-soaked hands on this little beauty—the Tequila Aroma Kit developed by my tasting teacher Ana Maria Romero Mena. It features 50 of some of the most common aromas found in tequila, in an extract form. The idea is that it allows you to train your nose to the aromas, and to help you confirm scents that you discover in particular tequilas. 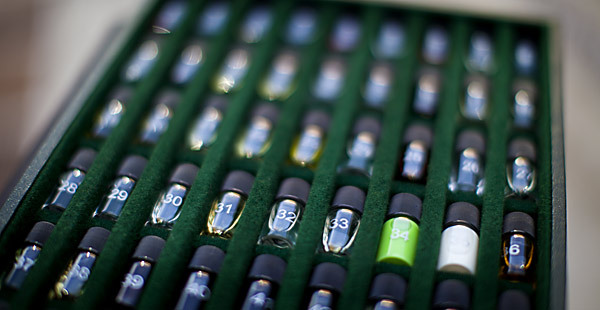 So, to use it as a training tool you can smell each vial (which is numbered – not labeled; a key code is included) and try to use your senses to determine what it is. You may start in a particular family—spices, for example—and then try to narrow it down from there. With spices, you may detect that it is not a green spice (like fresh Rosemary) and go through your associations until you discover it’s something like pepper. Once you get very good, you could say white pepper or black pepper since they smell differently. This is hard work—believe me—but tons of fun. Furthermore, you can use the kit to confirm what you believe you smell in a certain tequila. Just the other night Grover, Mark and I sat down with a new line of tequilas and went through this process. We agreed on some aromas right away, but then someone would detect something different, like banana. Using the kit, we pulled out the vial for banana and smelled the tequila and then the aroma. Nope, no banana. What a great tool! It’s one thing to thing to think you have a pretty good nose, and another to test it out. Just for the record, my nose needs a lot of training, but luckily I can work on it. Is this kit for sale? Would love to get my hands on it for practice. How would I be able to aquire this kit? I really would like to use it to train my nose and palate. I believe this would be a very valueable tool. i want a kit too!!! where could i be able to find it?? Donde puedo adquirir el Kit, cual es el costo? ?